If a reckless driver speeds towards a road-intersection without noticing that another such rash driver is also entering from other side of the road-intersection at same time, the crashing of vehicles is sure to happen. In such situations V2V (vehicle to vehicle) and V2X (vehicle to infrastructure) communications equipped car is informed about the vehicle heading in its way, so that even if driver errs, V2V enabled safety system overtake the control and slow down or even apply brakes. This can happen best through V2V communications tech. Not only preventing accidents and also control of acceleration based on vehicles around you help better mileage. This technology along with enhancing safety eases self driving task. V2V also lead to another concept in driving called 'vehicle platooning', where multiple vehicles can move like serially aligned units . Automation of toll payment, smart traffic signal management, vehicle monitoring by transport authority is eased by using V2X. More than anything else, the basic benefit of V2X is, it simplifies and eases the self driving of vehicles. V2X provides a smart road to cars irrespective of whether they have embedded self driving electronic systems or not. The safety applications called Left Turn Assist (LTA) and Intersection Movement Assist (IMA) can prevent up to 592,000 crashes and save 1,083 lives per year, claimed by some reports. To make this tech a more realizing, U.S. transport administration announced in Dec 2016 calling for V2V a mandatory in future vehicles. After U.S. more Nations may make V2V mandatory. The cellular vehicle to everything (C-V2X) and short-range wireless DSRC are exclusively used for V2X Communications where both set to complement each other. C-V2X is based on the LTE Broadcast and LTE Direct. The future 5G technology enables use of cellular for V2X in a better way. DSRC (Dedicated Short Range Communications) is a variant of common WiFi that falls under the 802.11p standard, where short messages are sent 10 times per second over a range of about 1,000 to 1,500 feet. Messages include vehicle's position, heading, speed and braking status. V2V is not limited to line of sight, it can see through other vehicles like a large truck or bus or around a corner. Experts argue about which is better, as of now C-V2X and short-range wireless DSRC standards fighting to take the space. Chipmaker QUALCOMM has come out with the study where it finds "C-V2X enables up to a few additional seconds of alert time and twice the range of IEEE 802.11p/DSRC". In Europe a new consortium is working on to push LTE-V technology. A company called Savari launched range of products targeting exclusively V2X market. The products include both the software and hardware. The software products such as Savari V2X stack and Security layer is offered in the form of middleware for software developers to develop V2X apps. The hardware units offered by Savari includes Road side units (RSU) as well as on-board units. 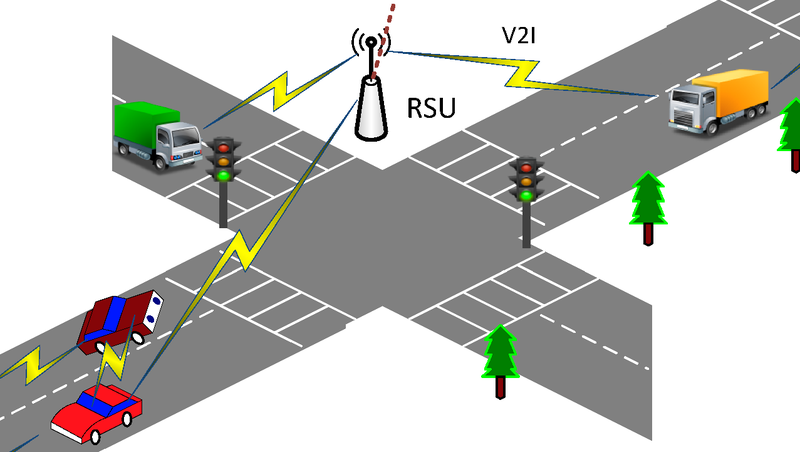 The RSUs can be deployed at intersections which can be connected to cars, predestrians and bikes. Autotalks in another company exclusively focusing on automotive V2X products. Autotalks provides both software and semiconductor chips targeting V2X market. Autotalks stresses on its ability to make the communication secure. The semiconductor chips such as V2X communication processor, V2X RF transceiver, PDX hardware add-on solution are some of the marketed devices by Autotalks. SECTON V2X hardware add-on solution packs enhanced-range mobility-optimized IEEE802.11p modem, an ultra-low-latency V2X Hardware Security Module (eHSM) and cryptoagile hardware verification engines. SECTON also supports IEEE 802.11a/b/g/n/ac to enable high-bandwidth external Wi-Fi. CRATON2 V2X Communication Processor packs IEEE802.11p modem, V2X Hardware Security Module (eHSM), hardware acceleration engines for lin-rate message verification, single/dual ARM Cortex A7 processor for running full V2X middleware and applications and optional secure CAN MCU. CRATON2 also supports IEEE 802.11a/b/g/n/ac to enable external WiFi. PLUTON (ATK3100) V2X RF Transceiver IC is optimized for V2X and is compliant with 802.11p. Autotalks is working with lot of leading automotive OEMs, some of the names include Cohda Wireless, Denso, STMicroelectronics, and Savari. Cohda develops IC chips to improve wireless communications further by offering off-the-shelf IEEE 802.11p transceivers. Spirent Communications released WAVE (Wireless Access in Vehicular Environments)-DSRC conformance test solution that includes a set of tests required for U.S. Department of Transportation (USDOT) certification. NXP's RoadLINK solution is a complete automotive-grade, secure V2X system solution. NXP RoadLINK solution is being introduced in first mass production cars in the U.S. through Delphi's communications platform. Renesas offering two system on chips for vehicle-to-vehicle (V2V) and vehicle-to-infrastructure (V2I) communication systems. The R-Car W1R 760 megahertz (MHz) band wireless SoC is for the Japanese market, and R-Car W2H SoC features security engine for V2X systems designed for the Japan, U.S., and Europe markets. The other solution consists of the W2H SoC combined with the R-Car W2R 5.9 GHz band wireless communication SoC developed for U.S. and European markets. Renesas R-Car W1R was adopted in Denso Corporation's in-vehicle ITS units. These units are also used in Toyota's Crown, Prius, and Lexus RX models for displaying traffic signal violation, cross traffic, and pedestrian warnings at traffic signals using car and infrastructure communications to warn drivers about approaching emergency vehicles and to assist cruise control and other functions. "I Am The Cavalry" (www.iamthecavalry.org), and industry consortia Auto Alliance (www.autoalliance.org) are working on V2X technology in the automotive sector. ETSI and the Car2Car Communications Consortium are engaged in defining compliance tests and test scenarios for connected vehicles. Model-based design is used for V2X applications like intersection assistance, collision avoidance, or hazard warning systems. A company called dSPACE provides virtual-testing tools for testing V2V and V2I applications by using open-loop and closed-loop simulations. Although the list is fairly complete, it leaves out the SCMS providers, like Green Hills, some of the stack providers, including Panasonic and Hitachi, and the major software security stack provider, OnBoard Security's Aerolink security library..